livehalffull | becoming my best self so I can be a better HALF! Head on over to http://www.livehalffullblog.com to check out my new site and design! Courtesy of my hubby to me for Christmas! I would greatly appreciate it if you would update your readers, blog rolls and follow my new page so you can keep following me at the new site. This weekend, Rich and I spent a few days in Michigan celebrating Christmas with my family and friends. Friday night we spent some quality time with my Dad. Saturday morning, we got a swim in at the gym where I used to work out growing up with my Dad. (It was exactly as I remembered!) Saturday night, we celebrated an early traditional Polish Christmas Eve with my family. Sunday, I had my high school friends over for our 9th Annual Dirty Santa Christmas Exchange! I can’t believe it’s been nine years of gift exchanges but I’m so lucky to have stayed in touch with those friends for so long! Today, Rich and I are attending mass and then we’ll be hosting my in-laws and brother-in-law for a traditional Wiglia dinner! Wigilia is the traditional Polish Christmas Eve and is something that I’ve celebrated since I was a little kid. Since Rich’s Grandma was Polish, Wigilia is something his family is familiar with. Even though my Mom wasn’t Polish, she did her research and we followed all the traditions every year growing up. I’m happy to continue the tradition with my new family! -Before you eat, everyone breaks the traditional wafer, called Oplatek, and exchanges good wishes for health, wealth and happiness in the New Year. The Oplatek is a thin, unleavened wafer similar to the altar bread in the Catholic Church. What are some traditions you follow with your family? Any new traditions you’ve started? Do you put more emphasis on Christmas Eve or Christmas? Merry Christmas Eve! Last night we returned from a weekend in Michigan with my family and friends. Now, we’re back and enjoying time with my husband’s family at home. This week, I’ve been in a reflective mood and am definitely ready to go over my 2012 goals and make some new ones for 2013. In the meantime, I’m off to yoga to set a relaxing tone for Christmas Eve. Take some time to be grateful for all you have today, even if you don’t celebrate Christmas, spend some time with my loved ones and enjoy all that you have! Yesterday, I had an extra day off. I was gracious enough by my employer to be given an extra day for the holidays and immediately took yesterday off to prepare for our trip to Michigan. At first, I was really pumped to use my day to get all my last minute Christmas preparations done. But then, when I woke up and it was rainy and gloomy getting things done was the last thing I wanted to do. So, I decided to own that feeling. It sounds silly, but for me, one of the things I struggle with is the overwhelming feeling to get things done at all times. I’m not good at relaxing, taking time off or “shutting down.” Really, the only time I’m able to sit and relax is when everything else is done or I’m extremely sick. As I’ve gotten older, I’ve been learning that time spent relaxing is actually beneficial. So yesterday, I spent some time relaxing and it was actually really good for me. The entire morning, I spent time on the couch surfing blogs, drinking coffee and being in the quiet. This time turned out to be just what I needed and from it I created a massive list of ideas for posts for the near future. With the new year approaching I have a ton of goals in mind that I want to reach and one of them is growing my blog. I know that I have a good thing going on and the inspiration I’ve received through blogging can hopefully be used to help others. Right now I’m off to finish up some last minute packing and fit a workout and a trip to the grocery store before we hit the road for Michigan for the weekend. I’m going to take the opportunity to spend the next few days unplugged and enjoy the time with my family and friends. I’ll be back on Sunday night with a full recap of our few days in Michigan and will be ready to spend a few more days relaxing and spending time enjoying our new Christmas traditions. I was nominated by the the adorable and bubbly Alicia at Blessed and Blissful for a Liebster award! This is the first time I’ve been nominated for a blogger award and I’m really excited to join in on the fun! The Liebster Award is an award given to up and coming bloggers who inspire you. The word Liebster is a German word and means Beloved, Dearest, or Favorite. This is such a sweet and loving award, and I am honored to be nominated! -Write 11 random facts about yourself. -Answer the 11 interview questions you’ve been given by the person who nominated you. -Nominate 11 bloggers and mention them in your post. -Go and tell the person who nominated you, along with the people you’ve nominated about your post. 1. I competed as a synchronized figure skater for 14 years. I went to Nationals 12 times and competed internationally as part of Team USA for 4 years. I can’t even begin to describe how much those years have helped me become who I am! 2. As a kid, I was obsessed with the impressionist artist Claude Monet. I’ve always wanted to visit his garden and next fall I will get to!!! 3. I never really pictured myself getting married or having kids until I met my husband. I always pictured myself as a big city career woman! But, once I met him I knew he was the one I was supposed to be with. Since we met at a bar he did not take me seriously when we first dated so I broke it off. After two months of not talking, he contacted me from Belgium to tell me he missed me and we went on a date when he got back. The rest is history. 4. I’m an only child and am definitely an old soul because of this. 5. I’m lucky to have several friends who have been around my whole life. My cousin Megan and I have been best friends since day one and my best friend Valerie and I became friends in Kindergarden. I also am still close with my best friends from middle school, high school and college! 6. I’m not really sure what color eyes I have because they change based on what I’m wearing or the lighting around me. Sometimes they are blue and sometimes they are green. 7. The summer before I signed up for my first half marathon my friend Denise and I ran 3 blocks to catch and train and could not run the full 3 blocks. Two years later we ran a full marathon together. 8. During my day job I sell advertising for television stations. I really enjoy my job and definitely consider it my lifetime career. I am lucky to look forward to going to work every day! 9. Growing up I was allergic to red and yellow food color. I’ve since grown out of it, but it was definitely a challenge as a child. 10. I’m not good at doing one thing at a time. I’m always multitasking and even when I’m “relaxing” at home I always have a load of laundry going, or am doing two things at once. This is a good and a bad thing. 11. When I moved to Chicago after college I had no job. I lived in a studio apartment alone with some money in savings and made my way! I’m pretty proud of how far I’ve come in the past five years. 1. What is your favorite type of workout? My favorite workouts really vary! Lately I love group classes, swimming with my hubby, running with friends and yoga to clear my mind. 2. Who inspires you? My parents definitely shaped who I am. My Mom had the best attitude and she helped me see the good in life. She and my Dad were also both very type A people which is where I get that. My Dad is by far the hardest working man I’ve ever met and he taught me how to work hard and achieve my goals. 3. Twitter or Instagram? I am getting into Twitter lately but I like looking at people’s Instagram! 4. How do you feel about your hair? I like my hair but of course always wish I had what I do not. My hair’s pretty thin and I’ve always wished for more volume. By now though, I’ve learned to love it as is! 5. Do you watch college or pro football? If so, who’s your favorite team? If you’ve been reading my blog you know I’m a diehard Michigan Wolverines fan. Born and raised! 6. What is your favorite quote/saying? I love quotes but my all time favorite is “If nothing changed, there would be no butterflies.” It’s a good reminder that life is constantly changing but there is always the opportunity to learn and grow. 8. Have you/would you ever go skydiving? I would totally! I am huge on heights. 9. Are you addicted to Pinterest, if so what are your favorite things to pin? I love Pintrest! I love pinning recipes, outfit inspiration and holiday ideas! 10. Would you ever be on a reality t.v. show? My college skating team would’ve made an amazing reality show. SO MUCH DRAMA! But these days, my life is a little boring. 11. What made you start blogging? I started blogging to track my progress while training for my first marathon and I’ve kept blogging to hold myself accountable. Now I keep blogging for the amazing community! 1.What’s your favorite holiday splurge? 2.How do you hold yourself accountable for workouts? 3.What made you start blogging? 5.Any goals in mind for 2013? 6.What is your biggest flaw? 7.What are you three favorite things about yourself? 8.What is your day job? 9.What is your go to snack? 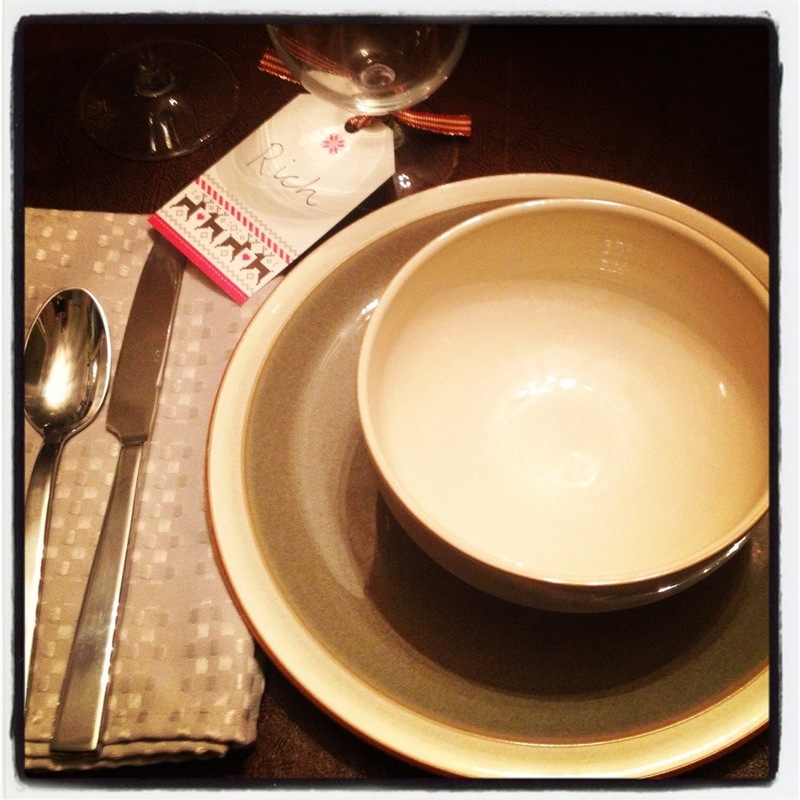 10.What is your go to weeknight dinner? 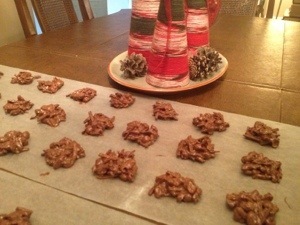 For my work Christmas party today, I made the easiest Christmas cookies ever! My family has made these cookies for years and for many good reasons-they are easy, delicious, only four ingredients and the recipe is foolproof and easy to remember! These are really easy to make for a crowd because you can easily increase the recipe based on how many you want to make. For my party, I made a double batch and ended up with 42 cookies. 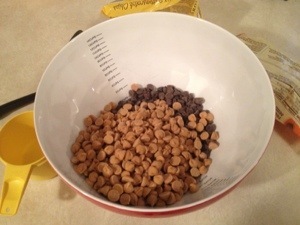 First, measure out the chocolate and butterscotch chips and put them in a microwave safe bowl. 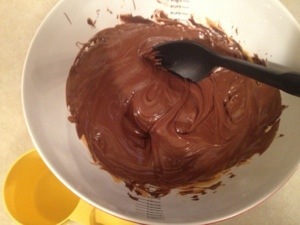 Then, melt them in one minute intervals stirring after each minute until the chips are completely melted. Once the chips are fully melted, you will end up with smooth, melted goodness. 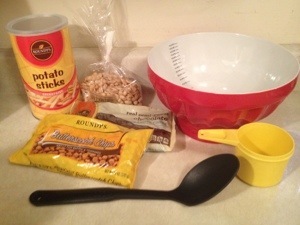 Next up, add the peanuts and shoestring potatoes. 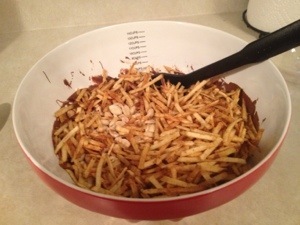 Stir to combine and make sure all of the peanuts and shoestring potatoes are completely coated in the chocolate mixture. Ideally, you want a sweet and salty combination with each bite. 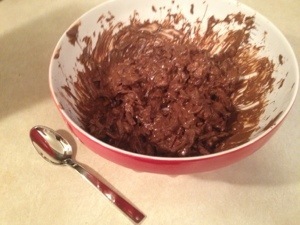 Lastly, you simply scoop spoonfuls of the mixture onto wax paper. Let them set for at least three hours or overnight. Once they are set, you are free to enjoy and share! I hope you like them! 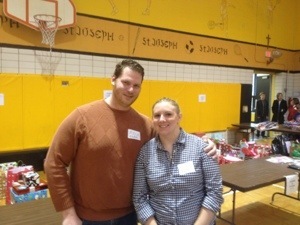 On Sunday morning, Rich and I woke up bright and early to volunteer at our church’s giving tree drive. This was our first time volunteering at church and we really enjoyed it! Our job was to sort the gifts as they came in and match them with the other gifts for each family. 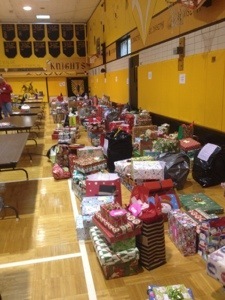 One we had we received all the gifts for a family, we would bag them up and tag them to be ready for pick up. It was a fun job seeing each family’s Christmas come together and I’m really happy the church was able to help out so many families in need. This holiday season, I wanted to make it a priority to give back. Not only did volunteering help others, but it helped me mentally feel good and remember the reason for the season! I’m hoping that this becomes a holiday tradition that I will look forward to for many years to come! Have you ever done any service projects around the holidays? Or better yet, during the year? I would love ideas of more things to do! Copyright © 2012. LiveHalfFull, All Rights Reserved.